On March 23, 1799 he was a member of the Aqueduct Association of the future Village of Whitesboro. 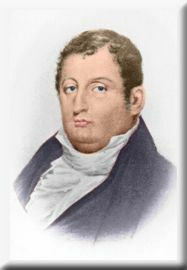 He was one of the first Trustees of The United Presbyterian Societies of Whitestown and Old Fort Schuyler in 1804 and 1805. At a very.early period in the settlement of the country [having received the honorary degree of Master of Arts from Yale College in 1789 he was established at Whitestown, Oneida Co., N.Y., in the profession of the law. On the creation of the clerkship of the Supreme Court for the Western District [in 1808], he received the appointment of Clerk, and remained the incumbent until his death. He was a man of much personal and private worth, sterling integrity and exemplary piety." "The children were held up to us as models of propriety.... I was deputed to show them the garden and the grounds, and told to pick all the fruit we wished, which they would not even taste without their mother's permission! This made a lasting impression upon me, and I wondered whether all the children in Boston were so well brought up." "No stranger of distinction passed through the town without dining, or partaking of fruit and wine, at the house, which was one of the finest in the place at that period. My father was very hospitable, quite an epicure, and noted for his good dinners and always very choice wines. "When the Court was in session, the judges and lawyers were frequently entertained. Although scarcely in my teens, I remember seeing Judges Savage, Woodworth, Van Ness, Sutherland and Platt - the latter was a connection of the family, and resided for a time in Utica. Among many others whom I particularly remember as constant guests were judge Southard (formerly Secretary of the Navy), John Greig of Canandaigua, Gov. DeWitt Clinton, Commodore Melancthon Woolsey, a near relation [descended, in common with Mrs. Judge Henry Livingston, from Rev. Benjamin Woolsey of Dosoris, L. I., and, on the Livingston side, first cousin of the first Mrs. Arthur Breese],23 and several officers of the U. S. Navy, that branch of the service having been always largely represented in our family. I have an indistinct recollection of peeping through the crack of the door to catch a glimpse of Commodore Chauncey, whilst he was dining with my father, and can recall visits paid by Commodores Rogers and McDonough, the hero of the battle of Lake Champlain; Chancellor Kent, Col. Malcolm, and seeing the great American novelist J. Fenimore Cooper. "My mother [the second Mrs. Arthur Breese] was an accomplished housekeeper, presiding with grace and dignity at her table, or in the drawing-room. On matters of taste she was authority in all cases. My lather used to plead, as an excuse for such constant entertaining, his 'having a fine house, a graceful and capable wife, and a well-stocked larder'"
"My father, who was then an invalid, and unable to be present at the reception, was told by the officer of the day that the General and suite would pay him a visit, if he so desired. This exceptional courtesy enabled my parents, and a considerable number of the elite of the city who had been invited, to enjoy the honor of an introduction." "I can well remember my mother's tasteful decoration of the drawing - rooms with flowers, the display of old-fashioned silver on the sideboard, and the table with choice wine and refreshments; and perfectly recall the personal appearance of the distinguished guest, the cynosure of all eyes -- his gracious and courtly manners, as with hat in hand he walked quietly up the broad steps of the piazza, and with much ease and apparent pleasure received the various introductions. Upon the conclusion of this ceremony I was led by my father to the General, who laid his hand gently on my head, and said 'God bless you, my dear!" 14 June 1825 - 6 June 1826 Died on Sunday morning the 14th inst. 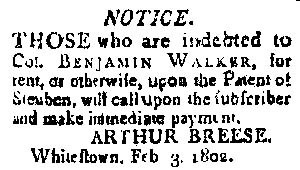 at New York, in the 53rd year of his age Arthur Breese Esq. of this place. At a very early period in the settlement of this section of the country, he established himself at Whitesboro in the profession of the law. On the creation of the Clerkship of the Supreme Court for the Western District, he received the appointment of Clerk, and remained the incumbent until his death. He was a man of much personal and private worth, of sterling integrity, and exemplary piety; and his loss is deeply felt by his friends and fellow citizens and by a numerous and interesting family. 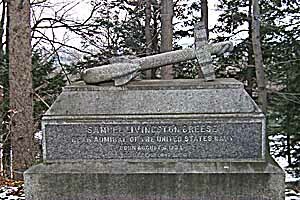 BREESE, Samuel Livingston, naval officer, was born at Utica, N.Y., in 1794. He began his naval career as midshipman in 1810, was commissioned Leutenant in 1816, and captain in 1841. In 1845 he was attached to the Mediterranean squadron in command of the frigate Cumberland, and during the Mexican war took part in the capture of Tuspan, Tabasco, and Vera Cruz. He was assigned to special duty on the great lakes in 1848; had command of the Norfolk navy yard from 1853 to 1855; of the Mediterranean squadron from 1856 to 1859; and of the Brooklyn navy yard from 1859 to 1861. In July, 1862, he was commissioned commodore. He was created rear-admiral on the retired list in September, 1862, and appointed light-house inspector. In 1869 he was port admiral at Philadelphia, and died at Mount Airy, Pa., Dec. 17, 1870. Rear admiral of the Navy of the United States, who entered the navy in 1810, and after sixty years of duty, including the war of 1812, the Mexican war, service at the Norfolk and Brooklyn navy yards, and as commander of the European Squadron, was placed on the retired list; he died December 17, 1870. BREESE, SAMUEL LIVINGSTON, naval officer, was born in 1794 in Utica, N. Y. He was present at the battle of Lake Champlain in 1814; was present at the capture of Vera Cruz in 1847; and was promoted to rear admiral in 1862. He died Dec. 17, 1870, in Mr. Airey, Pa.
Samuel Livingston, born Aug. 6, 1794; who married: first, Frances Hogan daughter of Jacob and Fanny (Carpender) Stout, about 1825, who died Jan. 8, 1853, without children; and secondly, Emma daughter of Thomas Lovett of New York City, June 21, 1855, who survives as his widow, without children; and died at Mount Airy near Philadelphia, Pa., Dec. 17, 1870. He was a member of the Class of 1813 in Union College, without graduation; and at an early age "received his warrant as Midshipman in the United States Navy. In 1814 he served under Commodore McDonough at the battle of Lake Champlain, and for gallant conduct at Plattsburg received a sword and a vote of thanks from Congress. He served in the Mediterranean against the pirates of Algiers and otherwise, in 1826-7, and was in the Levant during the war between Turkey and Greece. He also served with distinction in the war between the United States and Mexico, in 1846-7 -- was at the battles of Vera Cruz, Tuspan and others: of the last named place he was for a short time Military Governor. As Commodore he commanded the United States Squadron in the Mediterranean in 1856-7, during the Crimean War. 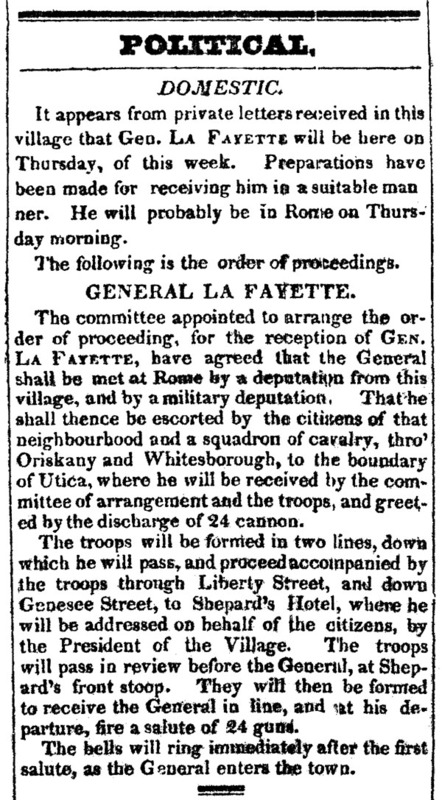 In 1861, at the outbreak of the rebellion in our Southern States, he was Commandant of the Brooklyn Navy Yard. He was one of the thirteen Commodores first selected to fill the list of Rear Admirals, when that rank was introduced into the United States Navy in 1862. His last official duty was as Admiral of the Port of Philadelphia, in 1868."